Garment and Textile Industry is labor-intensive. The latest increase of minimum wages in Haryana, India hits the garment manufacturing business. As garment industry is facing big challenges with 60% increment of average minimum wages from last minimum wages (January,1 2014 to June, 30 2014). Read on to know the growth trend of minimum wages. Haryana Government has fixed minimum wages for Unskilled, Semi-skilled, Skilled and Highly-skilled employees. The increase of minimum wages this time is very high compared to last 5 increments. Gugaon, Faridabad and Manesar are three major industrial clusters in Haryana state for ready-made garment industry.Where most of the export garment manufacturers are located other than Delhi, Noida and Greater Noida in Northern part of India. Minimum wages of employees for different skill level are as following for the period of July 1, 2014 to December 31, 2014. 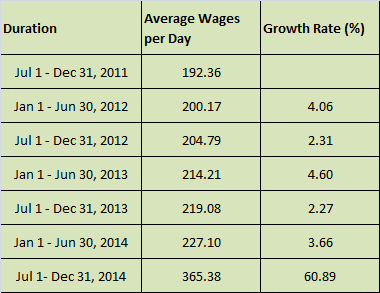 The trend of minimum wages increase is shown in the following chart from July 2011 to July 2014. Average daily wages are calculated from daily wages of 4 skill categories. 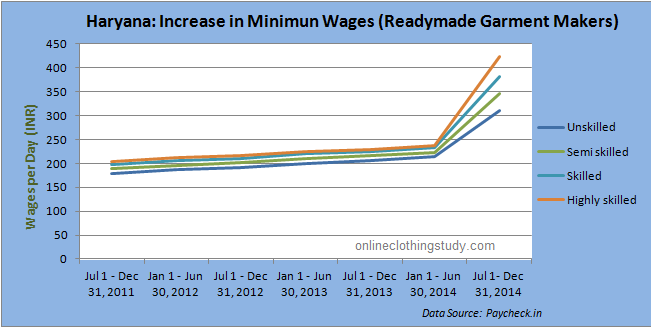 Garment industry has seen a big jump in minimum wage update from July 1, 2014. Minimum wage updates in garment Industry in India (State: Haryana) and growth rate has been discussed with chart and data.